Simple yet intensely satisfying. Cream dory gets cooked pretty fast and steaming the fish longer than is required is not really good. 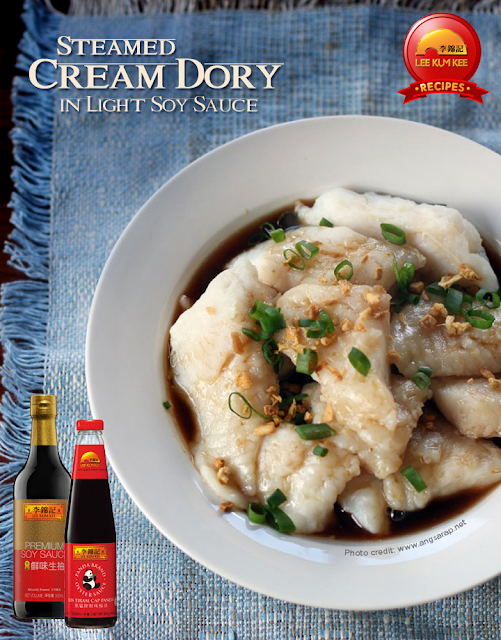 Cream Dory works great on this one but any white fleshy fish would be great. 1. Rub fish fillets with salt and pepper. 2. Place wax paper or baking paper on the steamer, leaving some vents on the sides (this prevents the fish from sticking) then place fish on top. Top the fish with some ginger slices then steam for 10 minutes or until the fish is cooked. Set it aside. 3. Combine the Light Soy Sauce ingredients in a saucepan, bring it to a boil then turn heat off. 4. Place the fish in a deep dish then pour the sauce over it, drizzle with Lee Kum Kee Sesame Oil on top then garnish with fried garlic and spring onions.